In everything with ancinet roots, mythology has the first word. 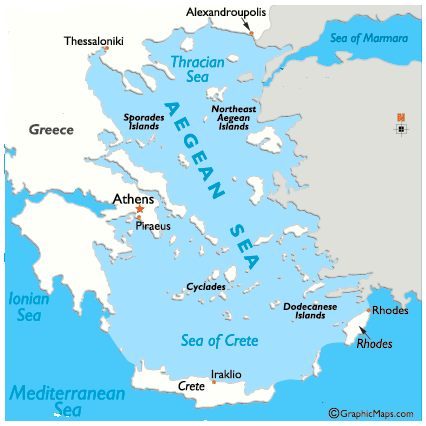 The Aegean Sea is named after the King of Athens , Aegeas who, according to the legend, fell into the sea from Cape Sounion, seeing the black sails on the ship that brought his son Theseus from the Minoan Crete where he went to kill Minotaur. The Athenians were obliged to send young men and women to Crete for sacrifice. 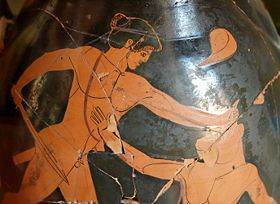 Theseus succeeded his mission, but returning back home forgot to raise the white sails, sign that things had gone well and everybody returned home. The point is that the etymology of the word, says things differently. The Aegean Sea took its name from the high waves that agitate it frequently. In the Greek language high waves are called aiges. And the adjective aigaios means great sea. The Aegean is the sea that lies between the coast of Greece mainland, the coast of Asia Minor and Crete. It has been formed by the subsidence and the lifting of Aegeis and the cracks of the Alpines mountains formation especially after the great precipitation in the Quaternary century. Tectonic changes from the Tertiary century created the morphology of the Aegean Sea , with main characteristics, the beautiful lacy beaches, the large number of islands and the vast variation in the topography of the seabed with basins, ditches and grooves. All this combined with the excellent climatic conditions that make the Aegean Sea, one of the most attractive seas in the world. For centuries the Aegean Sea has been the cradle of great civilizations and crossroads for the trade and communication between the nations of the West, East, North and South. The Aegean Sea is a closed sea. At the south, from the Peloponnese side, comes alongside with the Ionian Sea. From one side to the other of Crete, east and west with the Libyan Sea. The northeastern end is sequentially connecting with the straits of the Dardanelles - the ancient Greek, Hellespont and the sea of Marmara or Black Sea. The boundaries and extents of the Aegean Sea have been defined in 1919 during the International Hydrographic Conference in London. From east to west, the southern boundaries are from cape Marmara in southwest Asia Minor to the Myli cape in the north part of Rhodes and Prasonisi in the south. From there, to Karpathos and Kassos islands, to cape Plaka in the eastern part of Crete. And from the northern part of Crete, cape Agriogramvousa to the islands of Kythera and Antikythera, to Elafonissos in the gulf of Lakonia in the southern Peloponnese. The extent of the sea area includes at the north an imaginary line between the east coast of the Greek peninsula, the coast of Macedonia and Thrace and the coastline of Asia Minor, covering 250.000sq km. On the north coast of Macedonia and Thrace end up the valleys of the Axios, Strymon and Evros and shaped bays that reach deep ashore. The lands in other west and east coasts cut into large and small peninsulas that have countless bays and continue in islands and reefs as the division of land corresponds to the morphology of the Aegean Sea beneath the surface of the sea. Peninsulas are connected with the islands, communicating each other by undersea trenches and ditches. Geographers and geologists have divided the Aegean Sea into three sections, following the morphology of the coastline, the position of the islands and the shape of the seabed. The North, Central and South Aegean. The limits of North Aegean are the coast of Thessaly in the west, the coast of Macedonia and Thrace to the north and the northwest coasts of Asia Minor to the east. The southern limit is an imaginary line beginning west from cape Artemission, the southern tip of Evia and reaches east, from the southernmost tip of Lesvos in the coastlines of Asia Minor. The northern part of the sea area between Chalkidiki peninsula in Greece and the peninsula of Gallipoli in Turkey called Thracian Sea where the islands of Thasos and Samothrace are located. Southern, in the northern Aegean Sea the islands North Sporades having west to east orientation, Skiathos, Skopelos, Alonissos and some other smaller, Lemnos, Agios Efstratios and Lesvos which belong to Greece. The islands of Imvros and Tenedos, belong to Turkey. The limits of the central Aegean in the north beginning from west in cape Sounion, the south edge of Attica, cape Cafirea, the south tip of Evia and reaches to the east Samos island and from there on, opposite of the coast of Asia Minor. In central Aegean at the west we have Skyros, the southern islands of North Sporades and at the east the islands Psara, Antipsara, Inousses and Chios. The boundaries of South Aegean sea are, to the north the previous imaginarry line from cape Sounion to cape Cafirea, to Samos and the coasts of Asia Minor and south to the southern limits of the sea from Lakonia, Kythira, Crete, up to cape Marmara to Asia Minor. The Southern Aegean is considered the most important part of the Aegean Sea. There we can find most of the Greek Islands, the two large islands clusters Cyclades and Dodecanese, the islands of Icaria, Samos and Fourni to the east and to the west the islands of the Saronic gulf near Attica and the Argolic gulf in Peloponnese. The southern Aegean is divided into smaller seas, the Myrtoo Sea to the west, the Cretan Sea south and the Icarian and Carpathian Sea to the east. Each one of these seas often presents specific local weather conditions which are of great importance for sea navigation.